1: An Instrument Rack’s Chain Selector will crossfade between two instruments. For more than two, use separate Audio Effects Rack Chain Selectors instead. 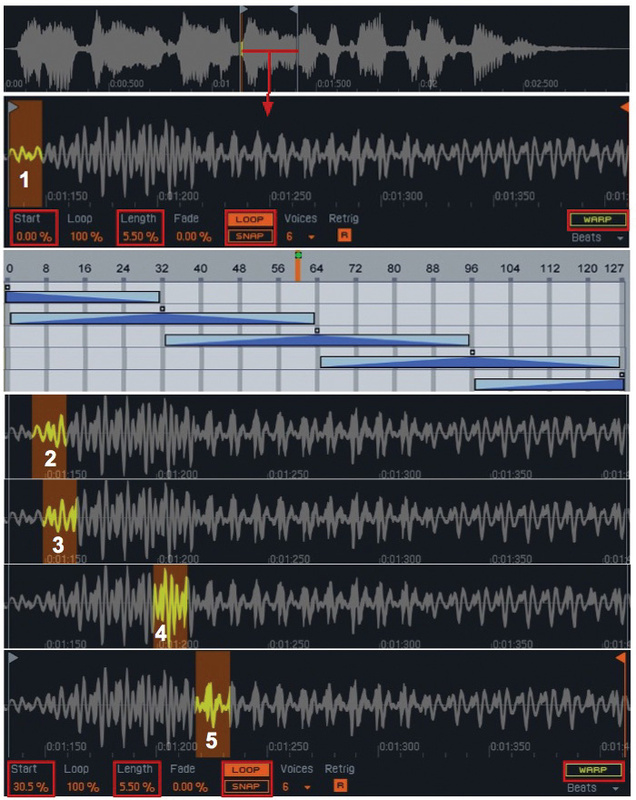 We show you how to get creative with the crossfader in Ableton Live. This month we’ll look at Live’s tools for real-time crossfading between two or more plug-in instruments. This has a variety of applications from simply transitioning between instrument presets to emulating wavetable synthesis. It’s worth noting that true wavetable synthesis differs from crossfading in several ways — for the real deal check out soft synths such as the Xfer Records Serum, PPG Wave 3.V or Waves Codex. The most obvious option for crossfading between two instruments is to place the instruments on separate tracks and use Live’s Crossfader. Right-clicking on the Crossfade control lets you select a crossfade curve, and the third choice, ‘Constant Power’, gives you an equal-power crossfade between the two tracks. You can then assign the Crossfader to a MIDI controller to manipulate it while playing. The downside to this approach is that Live has only one Crossfader, and it has a lot of other uses that you’ll have to forgo if you use it for this. (Check out the January 2014 Live column for a detailed look at crossfading.) So we need a Plan B, and the place to start is with an Instrument Rack. Create an empty MIDI track and drag a new Instrument Rack from the Instrument tab of Live’s browser to the track’s Instrument Drop area. Click the Rack’s Chain List button and drag the two instruments you want to crossfade to the Rack’s Instrument Drop area. That will create a separate chain for each instrument. Audition them one at a time and adjust each instrument’s output volume or its Rack mixer’s Chain Volume so that the two instruments have roughly the same level. Now click the Rack’s Chain button to reveal the Zone Editor for the two instrument chains. Expand each zone to span the full 128-step range and then drag the small slider above each zone so that the top chain fades out, whereas the bottom chain fades in across the full range, as shown in screen 1 (above). Finally, map the orange Chain Selector to your preferred MIDI controller (the Mod Wheel is a good choice). Although the Instrument Rack Chain Selector works well for crossfading between two chains, it is not well suited for more than two. To crossfade between three chains, for example, you might try the second configuration shown in screen 1, but the problem is that MIDI notes only trigger an instrument when its chain is selected, so for the first half of the range, the third chain is not triggered, and for the last half, the first chain is not triggered. With this setup you cannot crossfade all three instruments unless you trigger the note when the crossfader is at position 64. Fortunately there is an alternative, albeit a somewhat tedious one. Instead of using the Instrument Rack’s Chain Selector, place an Audio Effects Rack at the end of each Instrument chain and configure each Audio Effects Rack’s chain selector as shown at the bottom of screen 1. Map a Macro knob or a MIDI controller to all three chain selectors, and all three instruments will be triggered by every note while the knob or MIDI controller crossfades them by controlling their output levels. Notice that at chain selector positions 0, 64 and 127 only one of the chains is audible. 1. Create an Instrument Rack with a single chain holding Operator and follow Operator with an Audio Effects Rack for crossfading, as shown in screen 1. 2. Map the Audio Effects Rack’s Chain Selector to its Macro 1 knob and map that knob to the Instrument Rack’s Macro 1 knob. 3. Map the remaining Instrument Rack Macro knobs to any Operator parameters you think useful. In screen 2, I’ve chosen Operator’s LFO amount, filter frequency and resonance, filter envelope attack and decay, and volume envelope attack and sustain. Save this Rack as a template for building other waveform-based crossfade synths. 4. Select the Rack from step 3 and Group it as the first chain in another Instrument Rack (Command-G/Control-G). 5. Map the inner Rack’s Macro knobs to the outer Rack’s Macro knobs. 6. Duplicate the outer Rack’s chain (Command-D/Control-D) as needed to add layers to your crossfade synth. The Macro knob mappings will also be duplicated, saving you lots of remapping. 7. 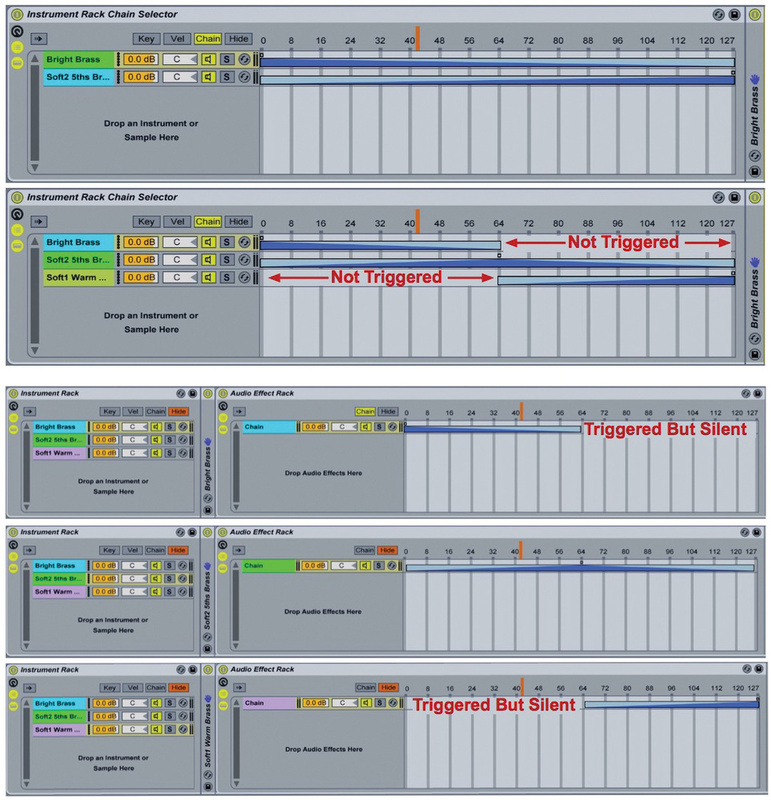 Reveal the Chain Select editor in each Operator chain’s Audio Effects Rack and set up the zones to crossfade across all your Operators as shown in screen 1. Screen 2 shows the Operator setup for this synth. In particular, only Oscillator A is active. It doesn’t really matter which Operator algorithm you choose, but I’ve used all oscillators in parallel. Create a different waveform for Oscillator A in each chain by selecting the Oscillator A tab and drawing your own harmonic spectrum or by selecting one of the waveforms from the oscillator’s Wave drop-down menu. 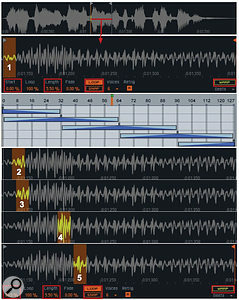 2: The Operator Template Rack (top) is used in the three chains of an Instrument Rack to emulate a wavetable synth. Instead of constructing your own waveforms, you can use several Simplers in Classic mode to crossfade among waveforms within an audio clip. It takes a bit more work to home in on the waveforms in Simpler than to construct them in Operator, but it also opens up endless possibilities. Speech clips, sound effects and sampled percussion are among the many good sources for waveform crossfading. In most cases you want Simpler’s Loop turned on and its Snap and Warp turned off. As a first attempt, load an audio file into Simpler and set Simpler’s Left and Right boundary flags to isolate a few hundred milliseconds for playback. Zoom in on the beginning of the playback section and use Simpler’s Length control to enclose one or a few cycles for looping. Play a note and use Simpler’s Start control to move the playback through the selected section of the sample. If you get a smooth transition, which almost never happens, then all you have left to do is tune the loop. For that, insert Live’s Tuner audio effect after the Rack and set the Hertz/Cents switch at the bottom of the display to Hertz mode (‘Hz’). Switch Simpler to its Controls panel and locate the ‘Transp’ and ‘Detune’ controls at the bottom of the rightmost window. Now play A2 (the A below Middle C) and use those controls to tune it to 220Hz. 3: Five Simplers are used to crossfade among short, tuned loops taken from a single spoken word.When you don’t get a smooth transition by scanning through the sample, another approach is to crossfade through a few Simplers by following the seven steps listed above using the Simpler setup just described instead of Operator. Initially, the Simplers in the duplicated chains will all be playing the same loop from the within the flagged region. Select different waveforms using each Simpler’s Start control. Then use the Chain Selector Macro knob or a MIDI controller mapped to it to crossfade among the Simplers, and therefore, the selected waveforms as shown in screen 3. Because you’re crossfading between loops rather than shifting the loop boundaries, you’ll always have a smooth transition. Audio Effects Rack crossfading is good for a lot more than wavetable-synthesis emulations. Start by adding audio effects to one or more of the Audio Effects Rack chains. For example, in a five-chain Rack try Chorus, Flanger and Phaser on chains one, three and five while leaving the other chains unprocessed. Try a Resonator or Corpus on just one chain. Try Simple or Ping Pong Delays with different delay times on the first and last chains. Even radical effects can yield surprisingly playable results when used on a single chain. Along with inserting effects, try different settings for the instruments in the various Operator or Simpler chains in the above examples. Try Live or third-party instruments and use different instruments in different chains. Or use different chain-selector patterns in the Audio Effects Racks. For example, have one chain-selector zone span the full range without any fades or have a couple of chain-selector zones crossfade over the full range while the rest fade in and out as in the examples.